Dana Wolff adds a fresh twist to the historical tale of Mary Mallon, the Irish cook better known as “Typhoid Mary” who was the asymptomatic carrier of typhoid fever in the early 1900s. Mallon worked for affluent New York families, unwittingly infecting members who subsequently fell sick and died. Finally incarcerated, she spent nearly three decades in permanent quarantine by order of public health officials. 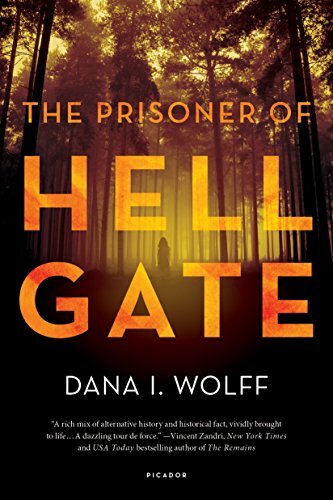 In this suspense thriller, Dana Wolff’s heroine is Karalee Soper, graduate student of public health and great-granddaughter of George Soper, the physician who initially tracked down Mallon and locked her away where she could no longer harm others. Until now, apparently. Kate’s sensitivity is both a blessing and a curse, because it hurls her and her companions toward one trouble after another. Her shore proposal sounds like a great excuse for an impromptu adventure. And after all the members of the boating party are all budding experts in communicable diseases. This naturally makes them full of hubris. Veteran mystery readers will see where the set–up is going, and so the question is how well Wolff leads us along, teases us, misdirects us, and delivers the inevitable punch. The answer, happily, is pretty well. The author leaves sufficient ambiguities unresolved: Who on the abandoned island is tending the garden next to the decrepit greenhouses? Who is the hermit woman who shelters them during a storm and cooks them dinner? Who hacked the bottom out of their boat, thereby preventing them from leaving the island? Ever since Agatha Christie’s Ten Little Indians, if not before, the plot device of one character after another meeting their end has been a staple of the genre. Woolf skillfully handles the elimination here, and manages to serve up a final surprise at the end as the last survivor finally understands the forces and karmic family connections that bring her to her fate.